It's very difficult to get a great map of Darjeeling showing all the details you need. Even the Google map of Darjeeling will not show you many attractions and places of interest, and sometimes be way off while indicating distances. I realized that it's actually very difficult to draw up a road map of a hilly terrain like Darjeeling. That's because the roads and places are at different altitudes in the mountains. For example if you take a top-down view of two roads laid at different altitude levels where one road runs below the other, they will likely merge on a 2-dimensional map and show as a single road. But that's incorrect as the two roads are in two different places altogether. So how to draw up a map and show the two roads separately that actually may lead to different destinations altogether? After a lot of thoughts, I was able to come out with a few maps of Darjeeling that I believe are the best that you can get. They are still not 100% perfect though. I had to divide the below maps into several sections in order to capture the right level of details. Let me start with the road map of central Darjeeling. This map centers around the town center like the Mall at Chowrasta and Chowk Bazaar. This should be the one you will mostly need if you are looking for the attractions and landmarks around the center of the own and the main market areas. On top right you will see the CR Das Road originating that leads all the way down to the Bhutia Busti Monastery and on the way passes through places like Step Aside. You can also clearly see in bold the Observatory Hill which is encircled by the lovely Mall Road. Other major landmarks shown on the Mall road are Gorkha Rang Manch Bhawan (which is mostly used as a public auditorium), the Darjeeling Tourist Lodge which is a government run 2-star hotel, the well known St. Andrew's Church, Darjeeling Gymkhana Club, Loreto College and the heritage colonial hotel Windamere. Further down you can see the Nehru Road that runs though rows of shops, restaurants, hotels and other commercial establishments. Some of the prominent landmark shown on the Nehru Road includes the old photo store Das Studio and the Planters Club that was established for the British planters during the colonial days. Often the Nehru Road is mistaken as the Mall road since it leads to the Chowrasta Mall. From the base of Nehru Road and on its left (west) runs another important road knows as the Laden-La road (which is named after a prominent ancestor of the present owner of hotel Windamere). This road also runs through many shops, restaurants and establishments including the State Bank of India, ICICI Bank, General Post Office and Big Bazaar. From the Chowk Bazar, there are roads leading to Lloyds Botanical Garden further down below the Eden Sanatorium. On top left of the map, you will find Bengal Natural History Museum which is located on Robertson Road and can be easily accessed from the Mall area (about 10 minutes walk). 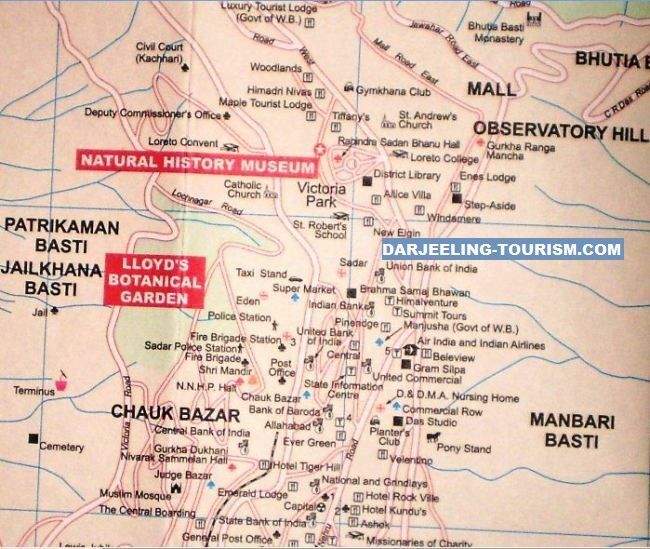 Here is an expandable & interactive map of Darjeeling. Use the navigation buttons to move the map and use the +/- buttons to zoom in & out and see more details. Jawahar Road that traces Raj Bhavan (Governors House), Shrubbery Nightingale Park, Himalayan Mountaineering Institute and the Zoo. Gandhi Road that originates from the base of Nehru Road, and runs by hotel Sinclairs, Swiss hotel, PWD Dak Bunglow, approach to Circuit House, PWD Inspection Bunglow etc. Tenzing Norgay road that leads to Aloobari Monastery etc. A section of Hill Cart Road passing though Samten Choling Monastery, Ghoom & Jorebunglow railway stations etc. Old Military road for Senchal Lake etc.